With Easter coming up in a week, I’ve had to start the ball rolling on the big party and hunt we’re planning at our house on Sunday. I’ll be making my usual batch of Jello eggs, but in addition am planning to make cupcakes, mochiko chicken, spam and kamaboko won ton, and dip. Last night we went to the evil empire (Walmart) and bought tons of Easter stuff like plastic eggs, more of that No Spill Easter Egg Coloring Kit that I found last year, some Robin eggs for cupcakes, dye kits, and plastic eyes to stick onto the eggs. Despite what I thought, I was able to make an Easter bento on time. 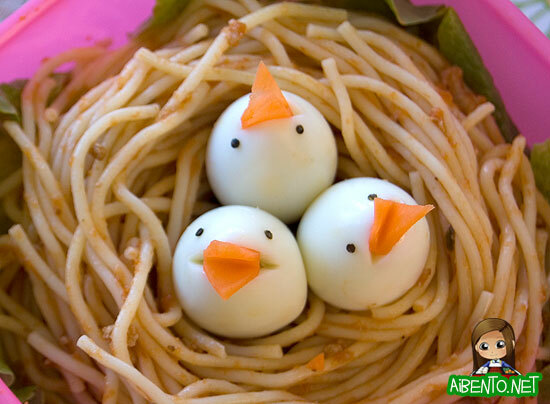 This was my lunch yesterday, made out of leftover spaghetti and three quail eggs as little baby chicks. I probably should have dyed the eggs pink or blue, but I was in a hurry and decided white would have to do. 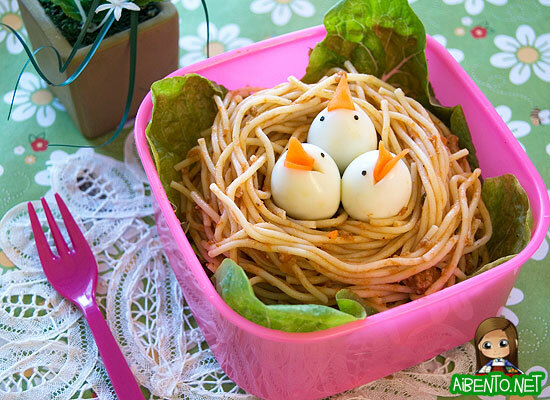 The spaghetti noodles are vermicelli, which makes it look more like a nest than thick spaghetti would. To make the beaks, I boiled a piece of carrot for a few minutes, just to soften it up but not let it get too soft. I then cut it into three small wedges and then cut out the middle of the wedge to get a beak. I then trimmed the back to make it thin so that it would fit into a slit in the quail egg. I poked a knife into the top of the egg and pushed the carrot beak in. I dotted each egg with tiny punches of nori, which I cut with one of my punches. Here’s a top view of the the nest. They’re hungry! Feed them!! The spaghetti nest is a bit of a mess to do. Wash your hands, then dump some into the bottom to fill the bento box. Line with lettuce, then start twirling the noodles around your bunched up fingers and lay it down. Keep adding to that circle of noodles until you have built up a nice nest. If you don’t have quail eggs, you’ll probably need to make do with one chicken egg. If not, you could always make little balls of cheese and use that as chicks, but that’s quite a bit of cheese!